Wood’N’Design produce a range of handcrafted wooden items incorporating modern and traditional decoupage. Our home page will guide you through a range of products which are designed for all ages and created with a great deal of love, care and detail. 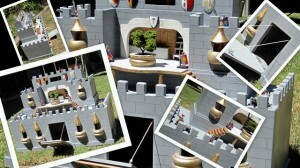 For the children we design and build dolls houses, King Arthur’s castle, toy boxes, toy garages and bookcases and produce a variety of handcrafted unique name plaques. We also make wooden scrapbook/photo albums, with designs in modern and traditional decoupage. The albums can be personalised with your photographs and/or memorabilia, or a name can be added. 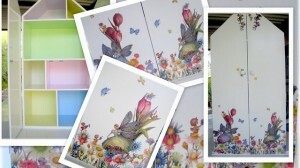 (For more details on personalised albums please see our Commissioned Works page). Our range of products also include a collection of decoupage boxes — jewelry boxes, document boxes, storage boxes and drawer sets. 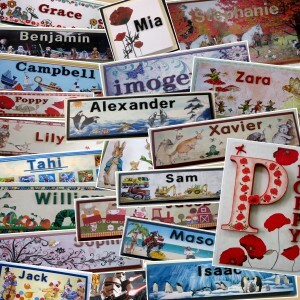 The individually designed name plaques are a very popular item, with our customers purchasing for family and friends overseas. Christmas is a special time. At Christmas we create a variety of wooden Christmas trees together with advent calendars and “count down ’til Christmas” trees. 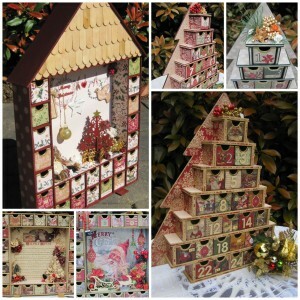 The advent calendars have proven to be extremely popular in their uniqueness in colour and design and present as a beautiful Christmas decoration in your home, or as a very special gift. Enjoy your visit to Wood’N’Design’s site. Please check the Events and What’s New page to see when we will be at the Old Bus Depot Markets and the Brindabella Business Park.